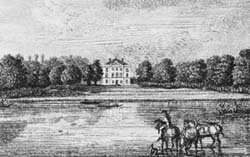 Marble Hill House was built for Henrietta Howard, friend and companion of the Prince of Wales, who later became King George II. She went to live there when she felt life at court was getting too much for her. The house is built in a style called 'Palladian', so-called after the Italian architect Andrea Palladio. This style is balanced. Inside, some rooms even have false doors that lead nowhere just to make the rooms appear symmetrical. Approach from the riverThe house now stands in a public park and most visitors arrive by road. When it was built many visitors would have come by boat and strolled through the gardens to the entrance on that side of the house.